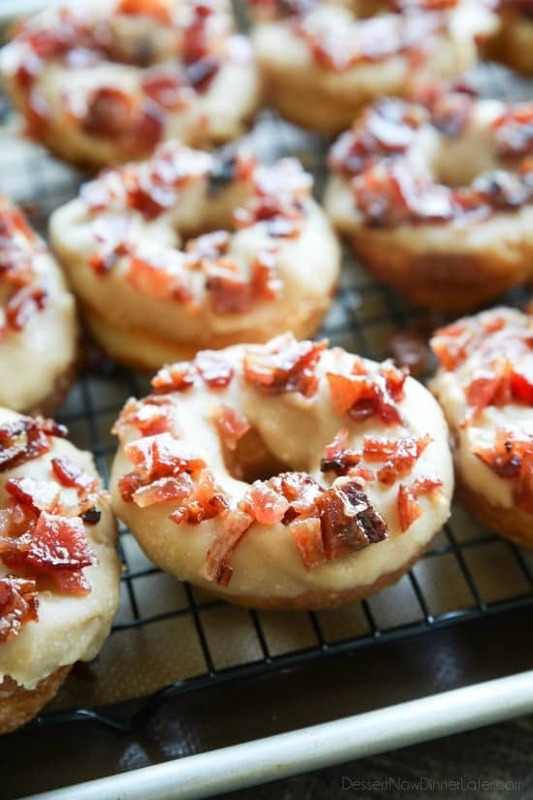 Maple Bacon Donuts - Dessert Now, Dinner Later! 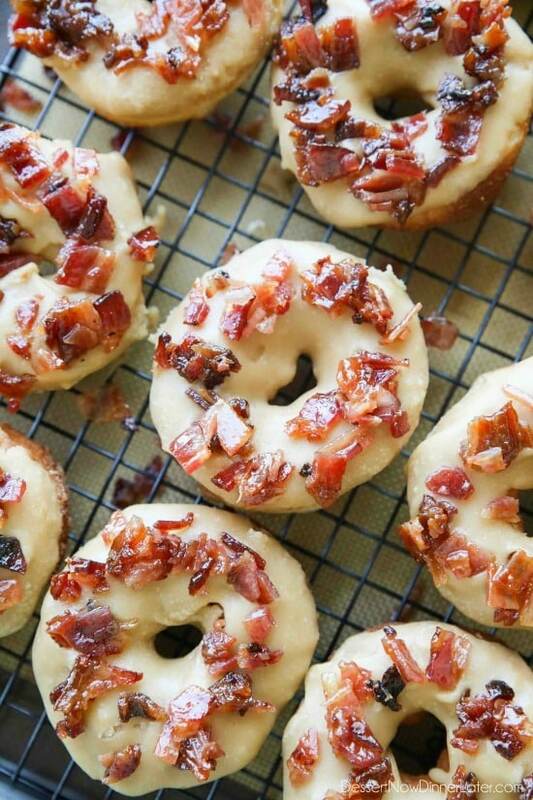 Maple Bacon Donuts are breakfast perfection! 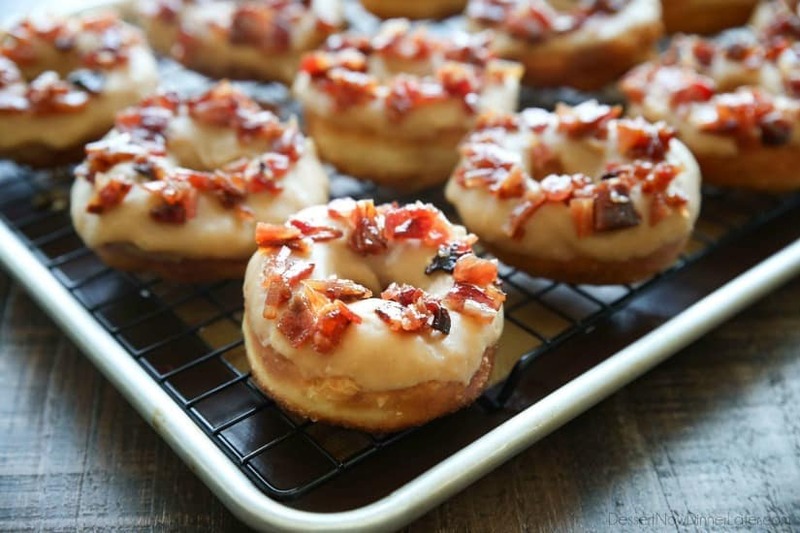 The salty bacon cuts through the sweetness of the maple and brown sugar glaze on top of a fluffy yeast donut. I have mixed feelings about donuts. I used to work in a bakery in college and one of my jobs was to dip and decorate the donuts. At that point in my life I HATED donuts. I guess when you see them every day you get tired of them. It’s been 10 years since I worked there, so I’m okay with donuts every now and then. Haha. 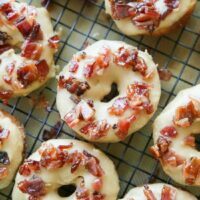 Maple Bacon Donuts are my FAVORITE! If I see those on the menu, it’s game over. I’m getting one of those! Maple glazed bacon is simply one of my favorite things. Maybe it’s because I like to dip my bacon in maple syrup, so the thought of the two combined into one delicious bacon candy treat is heavenly! 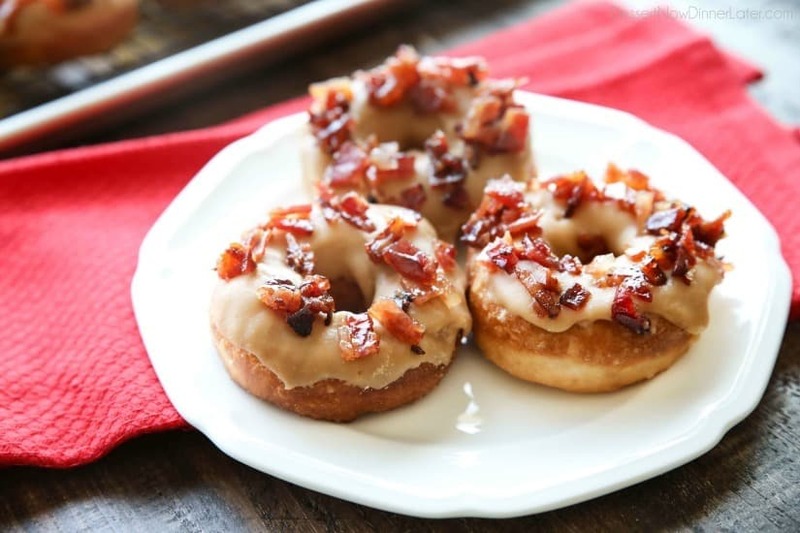 These maple bacon donuts have both a maple glaze and maple glazed bacon sprinkled on top. It’s all kinds of maple goodness. The saltiness of the bacon cuts the sweetness just enough to balance everything out. The actual donut base is none other than Rhodes frozen dinner rolls. Keeping it simple, but true to a real, fluffy yeast donut. 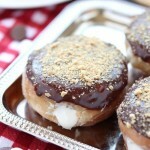 I have a feeling you’re going to love these! Our family sure did! Meanwhile, place the bacon on a wire rack inside of a foil lined baking pan. Brush the top of the bacon with half of the maple syrup and sprinkle with half of the brown sugar. Bake in a preheated 400 degrees Fahrenheit oven for 15 minutes. Flip the bacon, brush with the rest of the maple syrup and sprinkle the remaining brown sugar. Bake another 15 minutes, or until it reaches the desired level of crispiness. Allow to cool completely. Then chop into small pieces. While the bacon is cooking, start the glaze. Melt the butter, brown sugar, and milk together in a saucepan over medium-high heat. Bring to a boil and whisk constantly until sugar is dissolved -- about 2 minutes. Remove from heat and add the maple extract, salt, and powdered sugar. Add extra milk, 1 Tbsp at a time, to the desired dipping consistency (I added about 3 to 4 Tbsp, maybe more). Put the glaze back on the stove top and keep warm (lowest heat), stirring occasionally. Fill a pot with oil about 1 1/2 to 2 inches high from the bottom. Heat it up until nice and hot (about 350 degrees Fahrenheit). Poke a hole with your thumb in the middle of each roll and stretch it out, being careful not to deflate the roll completely. 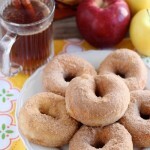 Drop 2-3 donuts at a time into the hot oil, turning once, and cooking until golden brown on both sides. Place each cooked donut onto a cooling rack with a tray underneath to catch any excess oil drippings. 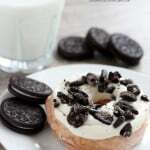 Allow donuts to cool completely. 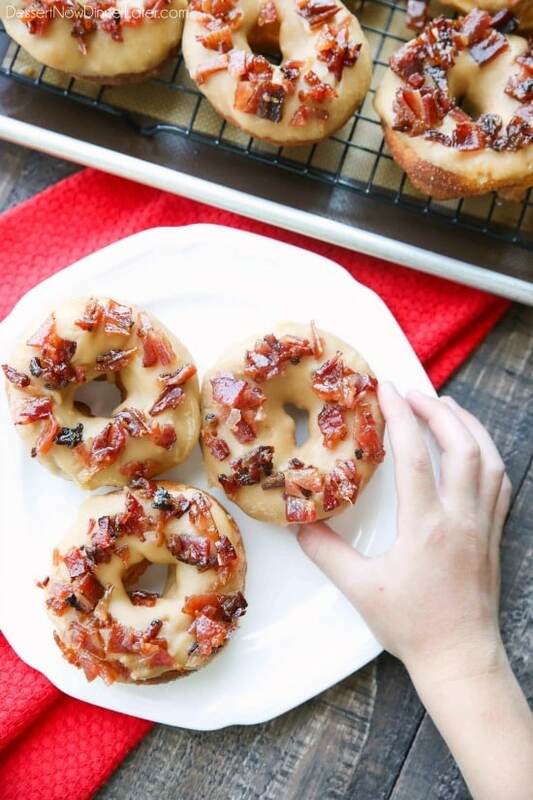 Dip donuts into warm glaze, one at a time, and immediately top with chopped bacon. (The glaze hardens quickly.) Repeat with all donuts. Enjoy immediately. Refrigerate any leftovers (due to the bacon). 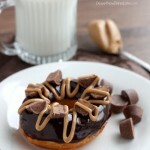 Oh, my gosh, Amber, these look and sound amazing. I’d like a dozen!